New Zealand’s reputation as a safe, peaceful place has taken yet another hit. The international press has picked up on the story about a riot at New Year celebrations in Gisborne, a town known for its drug and gang problems. Gisborne’s riot came days after a similar riot at the Britomart Rail Station, Auckland just before Christmas (Police vow to review CCTV footage of Britomart Riot). Rampaging youths closed down the city’s rail network. Youths exiting Coca Cola Christmas in the Park stormed onto platforms and hurled missiles over turnstiles at security guards and Maori wardens. 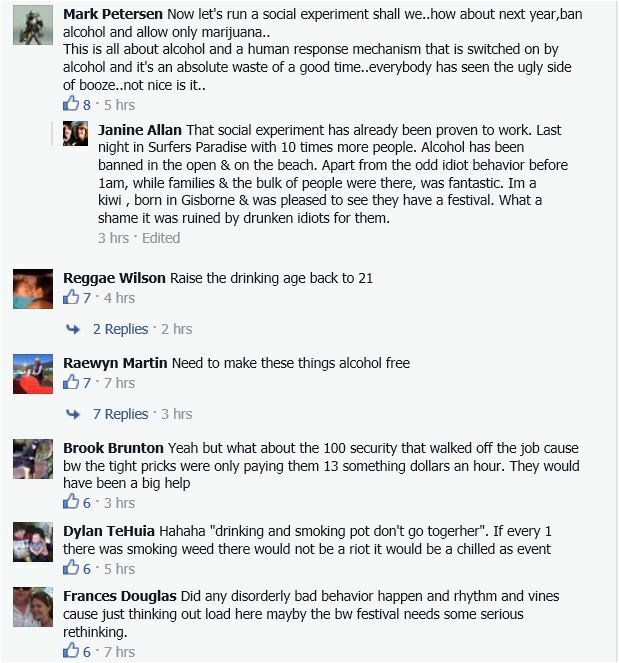 Gisborne’s riot started at the BW Summer Festival campsite. This wasn’t the first time the festival has had trouble and questions must be addressed about event security and alcohol policies. A concert go-er posted this comment on reddit/r/newzealand. He said the toilet portaloos were locked by staff at 4pm and fires were being lit around the site. Three hours later things got out of hand, culminating in police herding up campers around 7pm, creating an overwhelming mob they were ill equipped to deal with. There are also rumours that security staff walked off the site after a pay dispute. This is from Facebook. Surprisingly it is legal to drink in a public place in New Zealand, perhaps regulators could learn something from their Australian neighbours? More than 60 people were arrested and 83 others were hurt when a New Year’s Eve festival in New Zealand erupted into a riot. 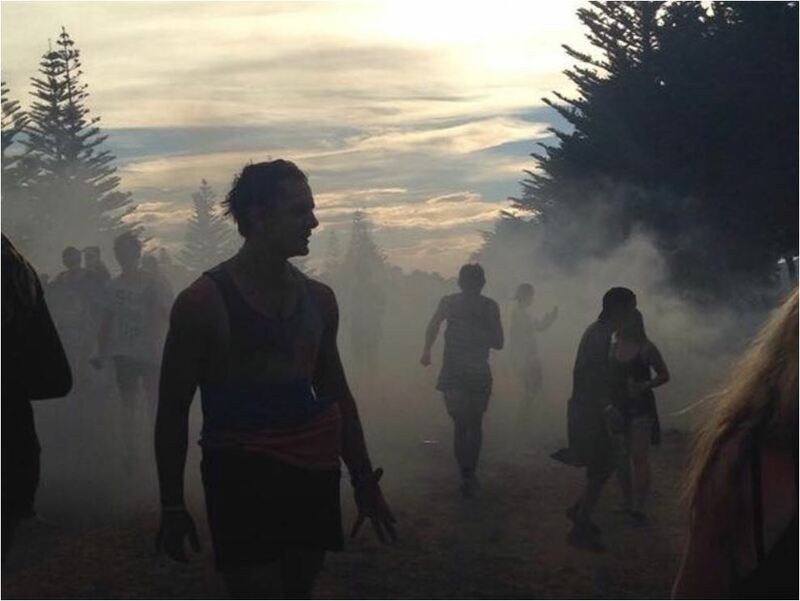 Police had a running battle with drunks for three hours, during which full bottles, cans and camping gear were used as projectiles at the Gisborne New Year’s Eve festival. The brawl broke out in the festival camp grounds late in the afternoon at the beach-side festival, during which cars were flipped over and fires lit. and the paper published pictures and video of the drunken brawls, most of which were taken before the sun had set on 2014. Mikayla Stuart, was working at a food stall inside the festival grounds and told Stuff.co.nz ‘I’m not too sure whether it was pre-planned or not but a lot of campers got on board with it very quickly. Images from the camp ground show worried party-goers cowering behind mattresses as projectiles rained down across the camp sites. NZ authorities are now investigating the rules around the event, which attracted more than 7000 people and allowed unlimited alcohol into the camps. It was a decision local police had unsuccessfully challenged ahead of the day. ‘This was an intentional riot that was fuelled by alcohol. It was obvious a plan had been put in place by the main agitators, which quickly spread through the campgrounds. We used every available police resource to try to keep control of the crowds, he told Stuff.co.nz. 83 people required treatment from ambulance officers for a range of injuries, seven were taken to hospital. By the end of the evening 63 people had been arrested at the scene. Thanks for returning E2NZ. I have missed your candour and willingness to report the unexpurgated truth. I worked a temporary security job when I first landed in New Zealand and I always found the Kiwis’ obsession with the alcohol nauseating. The normally passive Kiwis who were usually too eager to bend over and hand the Vaseline to their government officials transmogrified into monsters with some drink. Fights were prevalent and too much mayhem ensued. The same happened at bars. Admittedly, bars in North America and Europe have fights, but the frequency of fights was much higher in New Zealand, as the proportion of aggressive louts is much higher in New Zealand. Here in Switzerland or in neighbouring Germany and Austria, it is possible to buy alcohol at the outdoor Christmas markets and walk around enjoying a drink whilst shopping. It is also possible to drink on the trains and normal people enjoy a drink and conversation. I know that alcohol causes problems, but it is possible for people to drink responsibly and enjoy themselves. The problem is that degenerate subhuman Kiwis cannot do it. Lastly, I remember in New Zealand how managers that were in their forties and fifties would talk about getting drunk on the weekend the way 18-year-olds did in the USA. How is it that New Zealand promotes its worst to prominent positions? The Kiwis seem to be incapable of enjoying life without getting drunk. Kiwiville is white trash/chav world on steroids. Anyone that buys into the laughable notion that New Zealand would be a great place to raise kids, needs to think carefully whether they want to go from the pot to the frying pan. Thank you, sorry you weren’t able to post to this thread. Your comment has been moved from the Agora. Any more problems please let us know. That show is a drunken binge for most that attend and has been every year. The downtown gets plugged with traffic, drunken, dirty “campers” flood the town looking for food at about noon. There are usually arrests/problems via police, beach area/campground is TRASHED [abandoned gear, trash everywhere…] The face of NZ having a “good time”.